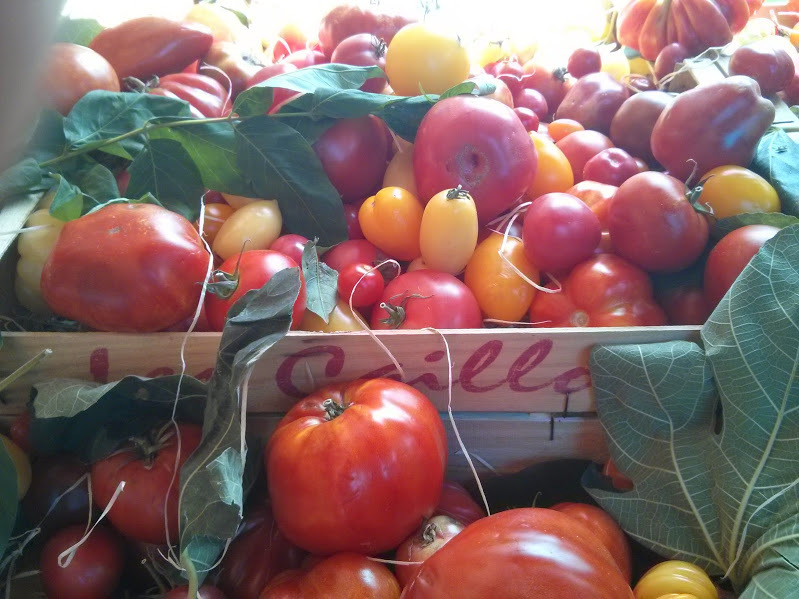 The last few days of summer have found me busily preserving tomatoes for use during the winter. 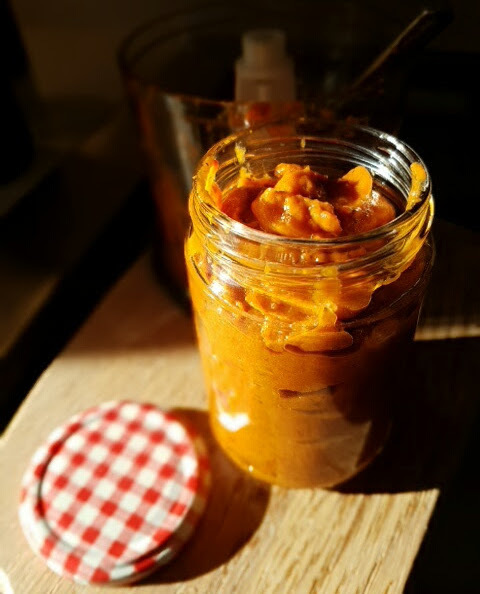 Over in France the long, hot August days were perfect for my first attempt at sundried plum tomatoes which sat shrivelling in the garden sun for two days before being tightly packed into jars with olive oil and thyme. 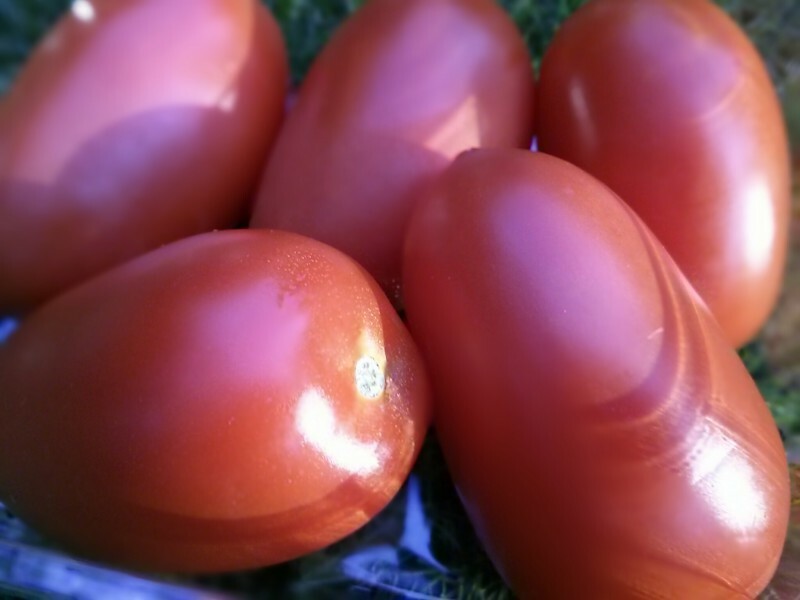 Back here in the UK we had a great crop this year and I batched up several cartons of homemade tomato sauce for the freezer which will be welcome reminders of warmer days during the coming winter months. All this tomato growing and preserving couldn’t go by without attempting a few new recipe ideas in the kitchen and in a departure from the tried and tested, a provençale classic, soupe au pistou, was subject to a rather tomatoey twist. Brimming with chunky vegetables from the region, soupe au pistou in various forms is made all year round. Name a vegetable and you’ll probably come across it in this soup at some stage during the year: courgettes, squash and broad beans in summer; pumpkin, turnips, and cabbage in winter. 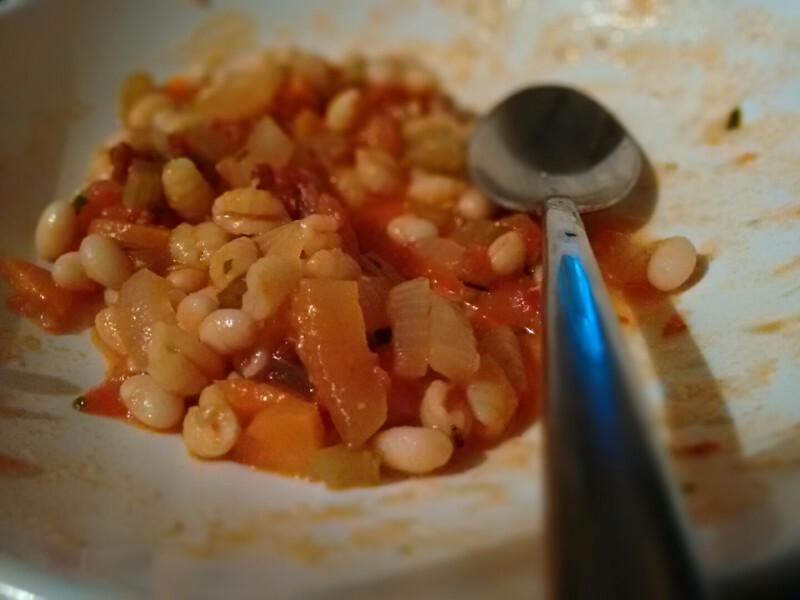 Tomatoes, carrots and onions are always present, and the soup is rounded off with a generous scoop of haricot beans and tiny pasta shapes or rice. The final, essential element is the delicious Niçois sauce called pistou – pesto without the nuts – a spoonful of which is added to the soup as it is served. 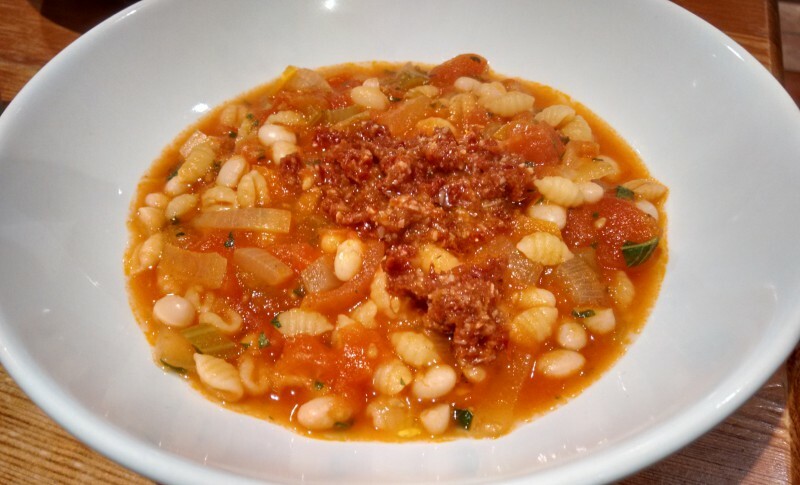 My version of the soup is heavy on tomatoes and lighter on other vegetables, but the finishing touches of haricot beans and pasta remain. 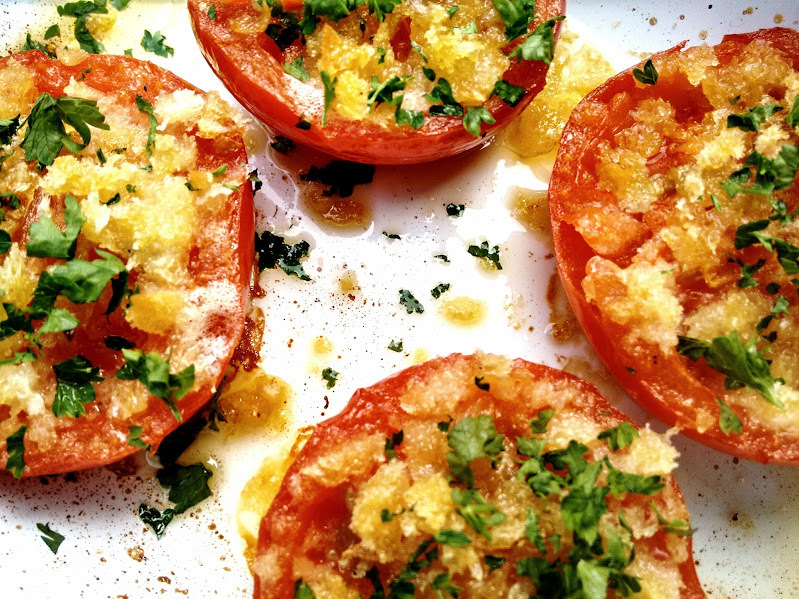 For the pistou, the aforementioned sundried tomatoes replace green basil, and this gives a real richness to the dish. 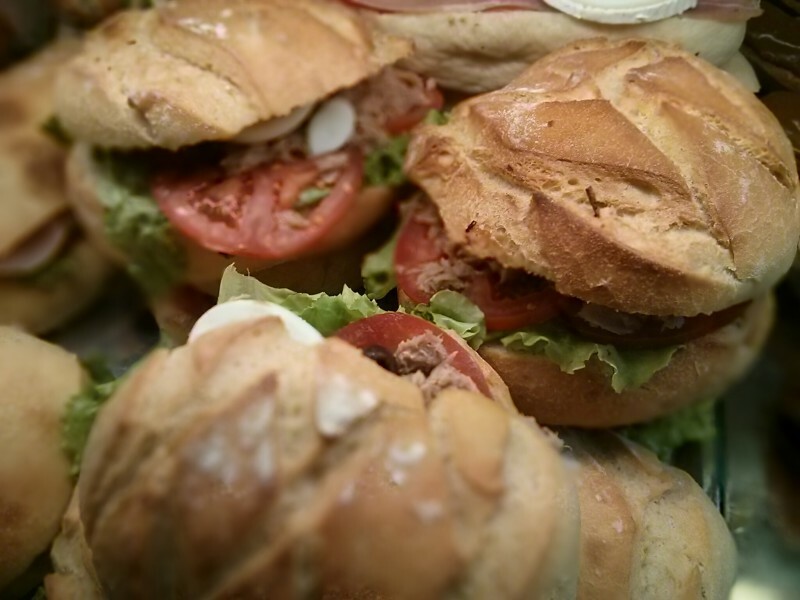 Add a hunk or two of crusty bread to go with it and you’re away! 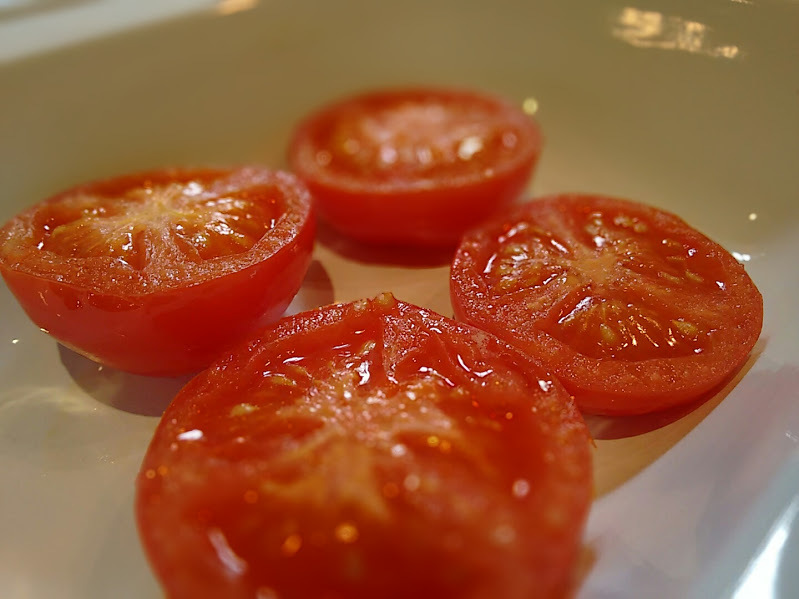 * To peel the tomatoes, scoop out the core with a sharp knife and cut a cross in the bottom of each fruit. Place in boiling water until the skins start to peel back. Remove and place in a bowl of cold water. The skins should now peel off easily. 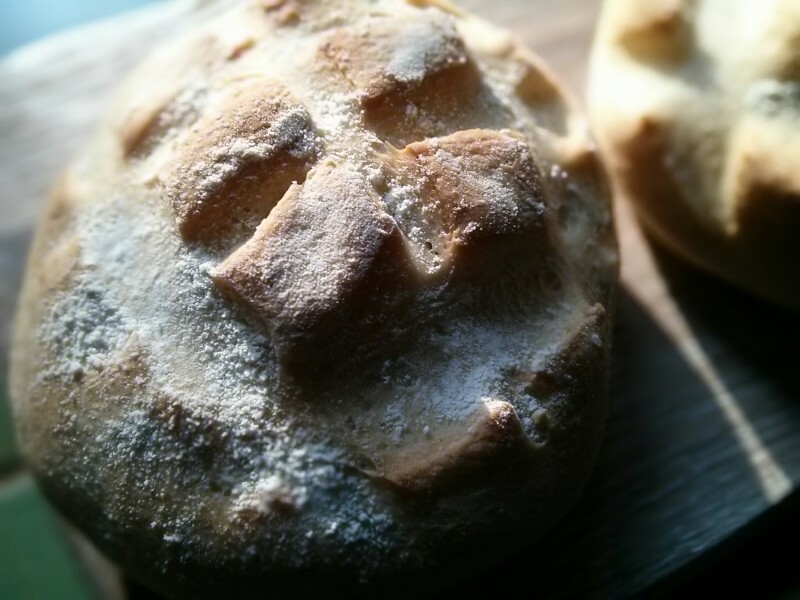 Place the pistou ingredients in a blender and blitz on full power for a few seconds. Stir and blitz again until you have a smooth paste. Put the sauce to one side or store in the fridge if it’s hot in the kitchen. Sauté the onion, carrot and celery in the olive oil until they are soft. Pour in the tomatoes and fry for a further five minutes. Add the stock, thyme and herbs and leave to bubble for 20 minutes. Then throw in the pasta and simmer again for ten minutes or so until cooked through. Finally, stir in the cooked haricot beans and chard / spinach if using. Remove the thyme stalks and bay leaves, then season with salt and pepper. Pour the soup into individual serving dishes and top each one with a good spoonful of tomato pistou. Ah, summer in a bowl. 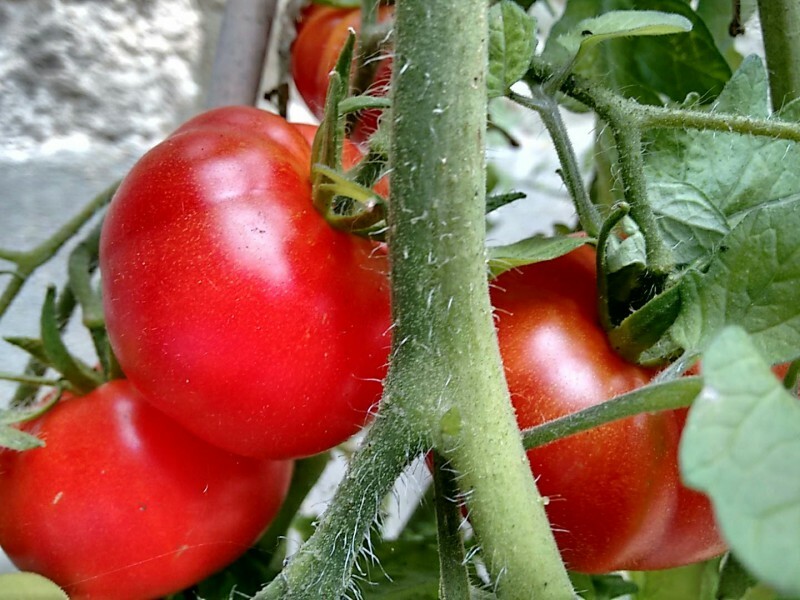 It’s full-on tomato season here in Dorset, and hugely satisfying to see so much ripe, red fruit both in the garden and the greenhouse. We might even be saved from the usual gallon of green tomato chutney this year. Over the summer we’ve munched our way through successive pickings of wild rocket grown from seed. The flavour is so fresh and peppery, the leaves so crunchy when just picked so it’s been a delight to mix up simple salads with this come again crop. Out in the lanes behind the house, blackberries and cobnuts are suddenly ready for picking, but if yesterday’s blackberry hunt with the kids is anything to go by there will be more eaten along the way than brought home for cooking. Anyway, more on the blackberries in my next post. One of the recent comments that came back when I asked friends and family what they thought of the blog was that I should probably write a bit more about pesto and pistou. That is the blog’s title after all. Good point. 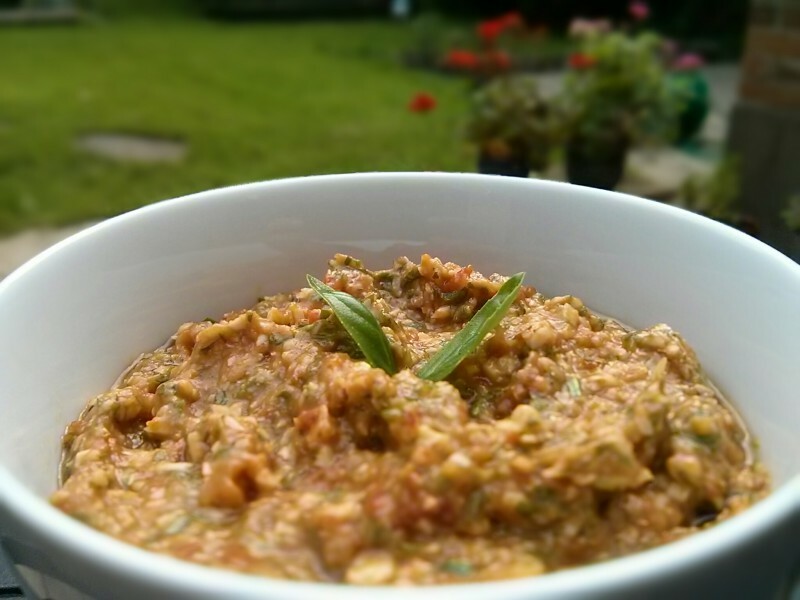 So I’m sharing my recipe for oven-dried tomato, rocket and cobnut pesto, a great sauce for late summer and a tasty way to use up a glut of ripe tomatoes. 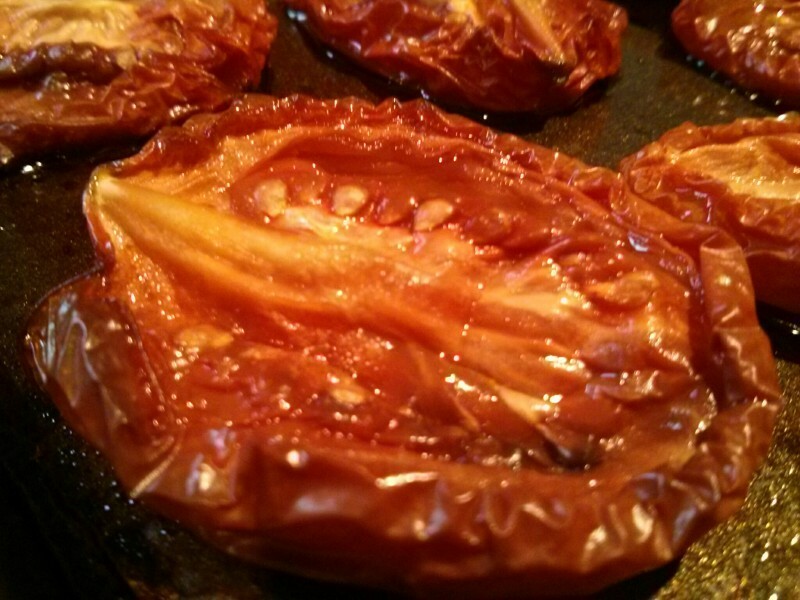 The tomatoes take three hours to dry out sufficiently in a low oven but you could use jarred sun-dried tomatoes in olive oil if you’re in a hurry. Go for pine nuts if you can’t get cobnuts. 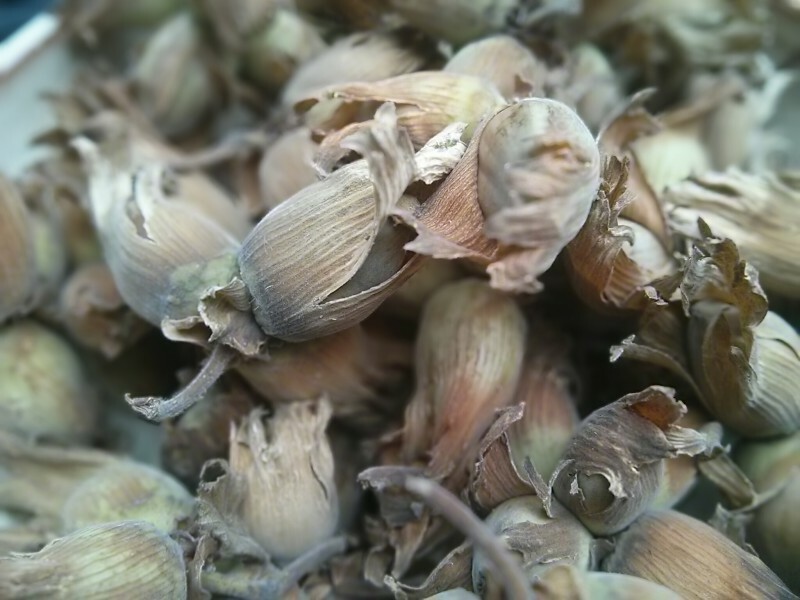 Kentish cobnuts are available now in the UK but the season is pretty short. No need to serve the pesto with anything complicated. Simply scoop a generous spoonful over linguine, add a few rocket leaves and top with a dollop of ricotta or a few torn strips of mozzarella. Why not add a spoonful to a bowl of fresh tomato soup or spread some over a fillet of grilled salmon or chicken? Let’s raise a glass to all this delicious late summer produce. Mine’s a soft red to go with the pesto – a Barbera from Piedmont I reckon and lightly chilled. Salute! 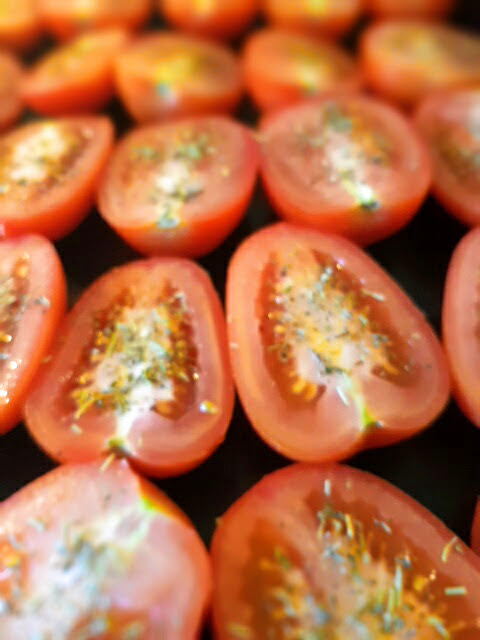 Place the tomatoes on a greased baking tray, sprinkle with salt and pepper and drizzle generously with the extra virgin olive oil. Bake in a low oven – 140°C – for three hours but do watch them to make sure they are not burning. 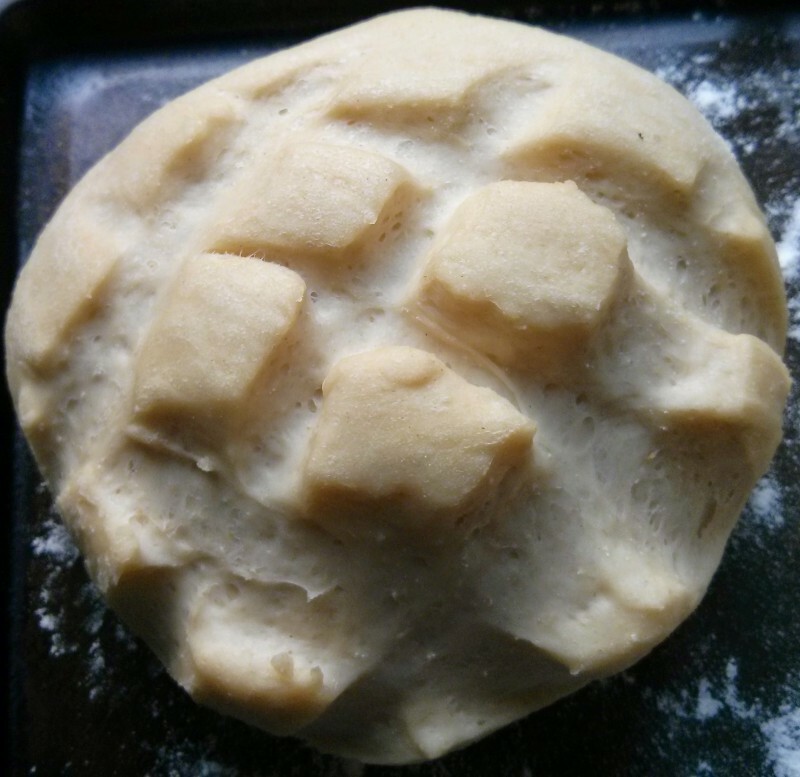 Remove from the oven when done and leave to cool. 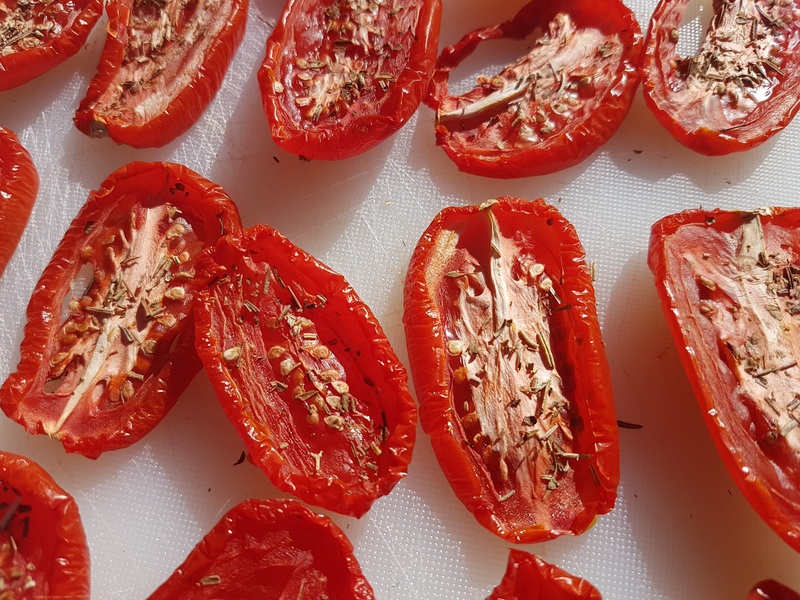 NB You can also jar up these dried tomatoes, cover them with olive oil and add a selection of herbs such as bay leaves, rosemary and thyme, and then you have your own oven-dried tomatoes to use during the winter. Place all the pesto ingredients in a blender and whizz until mixed. Add more salt and oil as required.